The Washout (AKA “Hollywood”) – The best surfing on Folly is in the area best known as “The Washout”. Experienced surfers claim this is where you can experience the best waves on the South Carolina Coast. Hurricane Hugo was responsible for The Washout. Where a block of homes once stood, the wind now blows unimpeded across the beach, through the wetlands and then to the Folly River. This wind effect is what experts claim causes the water there to “roll” so well. 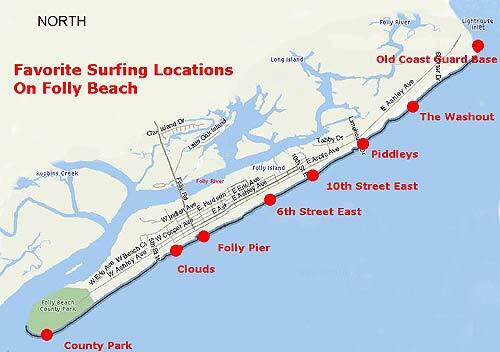 County Park  Area has strong currents near Folly River inlet which makes it seldom surfed. No surfing allowed in the swimming area. Can have surf on large SE swell. Use Caution. Clouds  Outside cloud break off Condos. Occasional big break. Folly Pier  NE side of pier cleaner on SE wind days. South side of Pier has long outside break. Good at low tide, East swell, NE wind. No surfing mid May to September. No surfing within 200 feet of the Pier. 6th Street East  Fair to good waves. 10th Street East  Popular spot but does not break as big as The Washout on NE swells. Can hold a nice south swell. Piddleys  Its usually small here. Old Coast Guard Base – Fickle break off SW sandbar. Strong currents. Use caution. Can have point break quality.